Lately I feel like we've had brown spotty bananas in our fruit bowl everytime I glance over at it. We must be over buying or under eating bananas in the SIL house lately, however, that's not such a bad thing. Why? 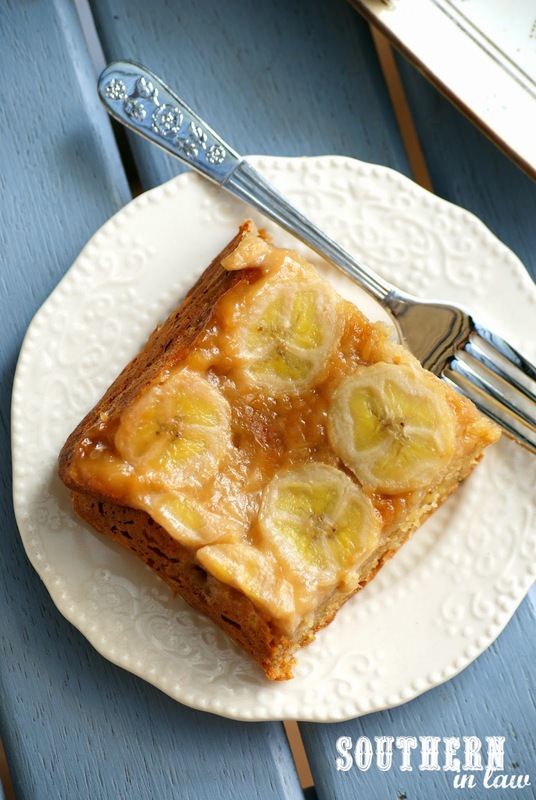 Because brown, ripe bananas mean delicious banana baked goods. I've made The Best Healthy Paleo Banana Bread Recipe, we've made banana muffins, we've made banana breakfast bakes - but we've also been making a little something different. 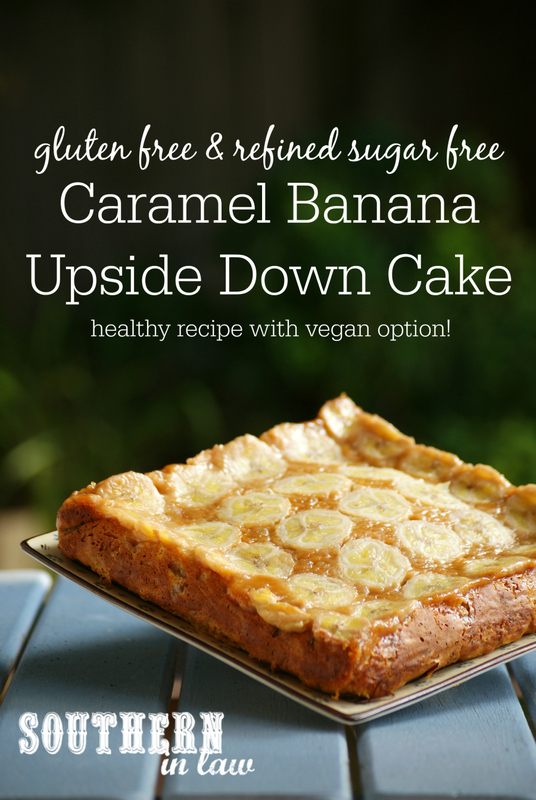 This cake was created after way too many batches of "normal" banana baked goods. You see, I wanted to make something to use up our spotty bananas, however, I wanted to try something different.... and I really felt like something with caramel too. And thus, my friends, this cake was born! This soft, fluffy banana cake is topped with yet more banana deliciousness and an incredible layer of our Healthy Three Ingredient Caramel Sauce. When you're eating it, you'll feel like you're eating the most decadent slice of heaven... but this cake has a little secret. You see, as well as being free from refined sugars, this baby is also low fat, gluten free - and you can even make it vegan. BOOM! 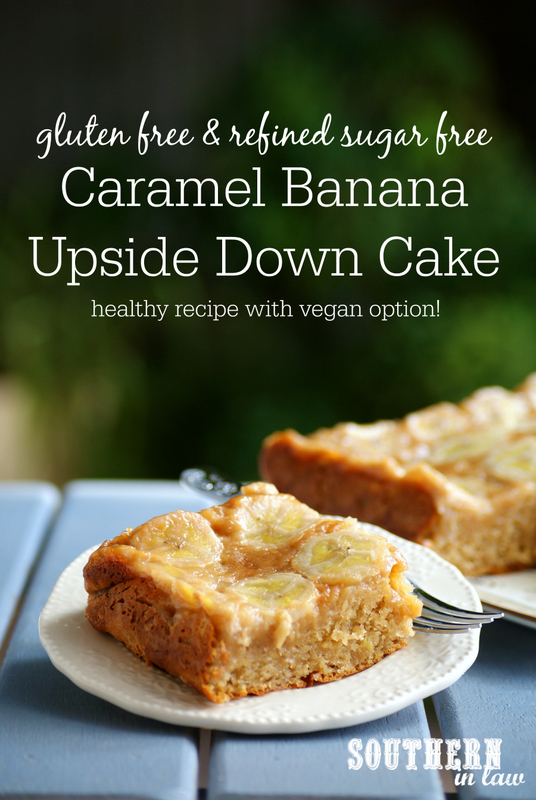 Banana cake for everyone! This is the kind of recipe that you'll wish you had brown bananas for - so go and check your fruit bowl or run to your local fruit and veggie shop or grocery store to snap up those ripe, unwanted bananas! They've found their calling in life because they're destined for deliciousness! Line an 8x8" square baking tin (or round) with baking paper and set aside. Slice your banana and place the pieces on the bottom of your baking tin. Set aside. Make your cake layer by mashing your bananas and combining them with your yogurt, oil, egg and sugar. Add in your flour, raising agents and pinch of salt and mix to combine, ensuring everything is incorporated. Set aside your cake mix bowl whilst you make your caramel (directions and ingredients here). Pour your hot caramel over your banana layer, using a spatula to spread the caramel out to ensure the entire top will be covered. Gently spoon your cake mix on top of your banana and caramel layer. It will be quite thick so try to spoon the batter on before carefully smoothing it over with a spatula to form an even layer. Bake for 30-40 minutes or until a skewer inserted into the middle of your cake removes clean. If your cake is browning too quickly on top, cover it with foil and continue cooking until a skewer inserted into the middle of your cake removes clean. Allow your cake to cool for 10-15 minutes before placing a large plate on top of your tin and carefully flipping the cake onto the plate with an oven mit or tea towel. Carefully remove your baking paper and serve! Our taste testers had mixed opinions on whether they prefered it warm, room temperature or cold, however, we all agreed that either icecream or extra Healthy Caramel Sauce (just make a second batch whilst your cake is cooking) was the perfect accompaniment to make this cake extra decadent! 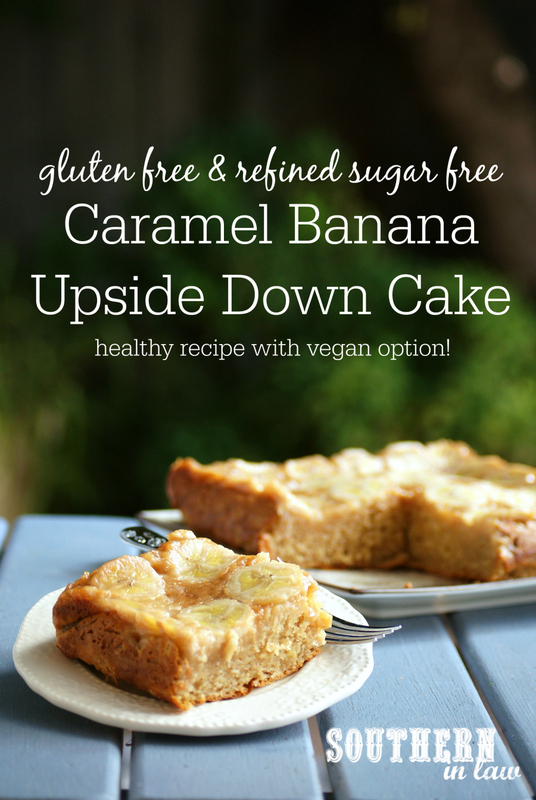 *For a vegan cake, use our Healthy Vegan Banana Blondies Recipe for the cake layer! But tell me, what's your favourite way to use up spotty bananas? And what is your ultimate dessert?